The Blue Angels Navy Flight Demonstration Team was formed at the end of World War II in 1945. The team's mission is to help recruit members to the U.S. Navy and Marine Corps and to represent those services to people around the country and the world. Applicants must be experienced U.S. Navy or Marine Corps pilots with good communication skills and a willingness to work hard. Pilots receive intensive training for acrobatic and formation flying, and then travel extensively performing in shows and meeting people. Contact a U.S. Navy or Marine Corps recruiter to get information about becoming a Navy or Marine Corps officer, the first requirement in becoming a Blue Angels pilot. 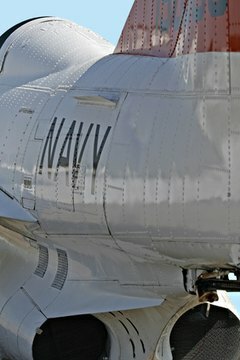 After becoming an officer, the candidate must apply and go through training to become a U.S. naval aviator. For selection as a Blue Angels jet pilot, the aviator must be trained to fly off an aircraft carrier, have 1,250 jet flight hours, and have completed an assignment with an active U.S. Navy or Marine Corps jet squadron. Indicate your intention to apply after you have the qualifications. Interest can be expressed to the applicants officer by email, placing a phone call, or submitting the initial application paperwork. The application should include a written recommendation from your commanding officer. Submit all required documentation including a 4-by-5 inch photo, the commanding officer's recommendation, and five forms found on the Blue Angels website. Check the website for deadline dates. It is also helpful to submit letters of recommendation from others to be included in your packet. Active applicants attend pre-show briefings and social functions to meet Blue Angels team members and ask questions. It offers a good way to understand the work and mission of the team. Team members may be standing beside their aircrafts, before or after the show, and will be open to questions from the public. If you become a semi-finalist for the Blue Angels team, you will have to travel to Pensacola, Florida, for approximately three days of formal interviews. When semi-final selections are made, those candidates receive invitations and arrangements to interview. New team members report to Pensacola to begin training after final approval. Demonstration pilots are required to remain on active duty for two years following their tour with the Blue Angels. Check for application dates and current team openings. Some positions are selected 15 months prior to reporting dates. If you are just starting your career, talk to a Navy or Marine recruiter about what qualifications you will need to become a military jet pilot. Hance, Susan. "How to Become a Blue Angel Pilot." , https://careertrend.com/how-6361411-become-blue-angel-pilot.html. 19 December 2018.